The Sound of Silence: A quiet home is relaxing and serene. Rockwool Soundproofing insulation quiets a home and creates a peaceful haven of quality and solitude in new and existing homes and commercial buildings. Soundproofing interior walls is also a good idea. This one-time luxury is now affordable. Your family will then be able to enjoy different activities simultaneously (such as using the computer, watching television, reading and sleeping). Sound Facts About Noise Control. A quiet home is relaxing and serene with a peaceful aura of quality and solitude. Homeowners realize that unwanted noise affects comfort, concentration, and behavior. That is why it is crucial to soundproof the ceilings, walls, and floors with a material that effectively controls sound. And since noise from within the home can be equally disagreeable, it is a good idea to soundproof interior walls and floors - so that several people or groups can simultaneously enjoy different activities (such as watching TV, reading, and using the computer). Why we use Rockwool Soundproofing. Rockwool Acoustic Insulation Materials are Safe and Effective. Rockwool acoustic insulation can be found in many different forms including loose infill and rigid panels or boards. The term rock wool stands for insulation that looks like it is made of wool materials but in fact, it is actually made from rock fibers. Rockwool insulation has been around for a long time and there is no known health risks associated with the product. The only side effect associated with the product is temporary itching during the short amount of time it is handled when it is being installed. Rockwool acoustic insulation materials have many helpful qualities including one of the most important, incombustibility. The fire barrier benefits alone make Rockwool sound insulation an excellent option for both residential and commercial applications. The light weight material is also resistant to moisture problems, which in turn means that the material will also retain its form or shape for a very long time. Blown in and insulation batting are especially helpful for the soundproofing of a home because the fibers fill in even the smallest spaces. Sound can travel without stopping even through smallest of holes until it meets an absorbing barrier. Acoustic Rockwool wall/ceiling insulation must be installed properly and tightly in order to gain maximum soundproofing benefits. The future of soundproofing Insulation is NOW, and Rockwool Premium Plus™ Insulation is an environmentally friendly product that is setting the standard for the 21st century by combining Thermal Efficiency, Acoustical Control, and Fire Protection all in one product. 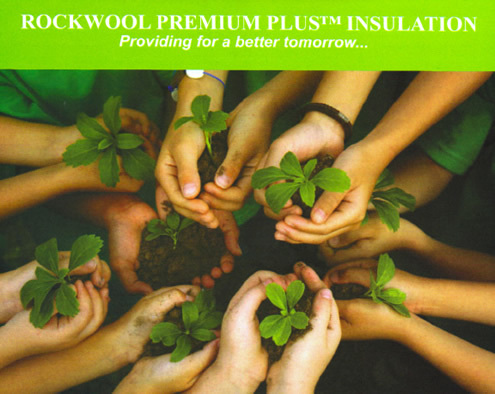 Rockwool Premium Plus™ Insulation is an ecologically sound product made from renewable products and recycled materials. It contains NO asbestos, formaldehyde or chemical additives. It is NON-combustible, NON-corrosive, and odor-free. It will not absorb moisture; therefore, it will not sustain mold, mildew, or fungus growth. Rockwool Premium Plus™ Insulation will not settle, decay or breakdown. Soundproofing floors and walls can reduce unwanted noise by 80 to 90%. Properly insulated attics and walls can save you up to 20% to 30% on heating and cooling cost.